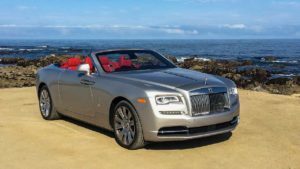 The prestigious 2017 Rolls-Royce Dawn comes equipped with a 563-hp, 575-lb-ft of torque twin-turbo 6.6-liter V-12 engine that sends power to the rear wheels through an eight-speed automatic transmission. This 5,600-pound two-door convertible delivers an EPA-estimated 12/19 mpg city/highway and can hit 62 mph in a manufacturer claimed 4.9 seconds. Lowering the convertible top takes 22 seconds and can be done at speeds of up to 31 mph. The front grille of the car has been pulled back by 45mm and the front bumper extended by 53mm compared to the Wraith. The Spirit of Ecstacy continues to take charge atop the bonnet and it’s an uncompromised design aimed at a younger, more dynamic clientele.Stowing away the Dawn’s top is done in unbelievable silence, taking just over 20 seconds and up to 50km/h. You barely hear the intricate mechanisms working as the fabric top shuts tightly away. The goal was to create the quietest convertible in the world today and this achievement is given a name – the Silent Ballet. The insides are an interesting concoction of contradictions  you have a minimalistic ergonomic arrangement adorned by the best quality of materials you can imagine. The design is stately but beneath its imperial poise nestles some of the best infotainment technology. The BMW-borrowed iDrive system is still one of the most multifarious and exhaustive. But once you get past its learning curve it is just as easy to use as your everyday smart devices. It isn’t about fiddling with superfluous buttons anymore. You simply pull and pinch or draw letters on a touch pad.The other bit of ingenuity is the adapted Bespoke audio system which I tried out, to the delight of passerbys and maybe to the annoyance of some with the roof down. It has been calibrated and fine tuned by audio engineers to suit either of the Dawn’s dual personalities. When the roof drops it adjusts the 16 individually tuned speakers to perfectly balance the acoustics. The Dawn is powered by the legendary 6.6-litre turbocharged V12 belting out 563bhp of power at 5250rpm and 780Nm of torque from 1500rpm. The refined mill is mated to a custom built eight-speed automatic gearbox that sends power to the rear wheels and propels the Dawn from zero to 100kmph in less than five seconds. And it is impressive as the Dawn weighs a tad above two and a half tonnes.Rolls Royce Dawn mileage has been rated at 8.86kmpl.According to Rolls Royce, with the roof up it’s almost as quiet as the Wraith and is perhaps the quietest convertible in the market. As per Rolls Royce it’s one of the stiffest convertible. There’s anti squat and anti dive suspension system so that the stance never chances under heavy braking and acceleration. The car can touch 60mph speed in about 4.9 seconds and the top speed is electronically limited to 155mph. The downy softness of the car’s secondary ride combines with a gently loping primary gait, and the quietness of the former and amplitude of the latter communicate perfectly between them how hard the suspension may be working at any given time to contain the car’s mass and preserve the magnificent, floating isolation of the cabin.Around town and at low speeds, the car rides predictably well – as only cars of such weight and skilful, uncompromising tuning really can.At higher speeds, your chances of feeling what’s going on under the car’s contact patches are even more remoteAlthough it’s air sprung, the suspension gives the natural, honest, predictable impression of a really good steel-coil chassis and never feels at all brittle or hollow. Just breezing along in the car, in no particular hurry, therefore becomes an experience truly to savour.Increase your pace and although the Dawn obliges you with plenty of speed, grip and controllability, it also begins to communicate quite early on that it’s progressing beyond its comfort zone. Body roll is the chief telltale; tackle a tight, well-sighted B-road corner with not excessive speed and you’ll get plenty. Just like the Wraith, the Dawn is equipped with a range of frontal, side-impact, and side-curtain airbags, as well as knee airbags for both the driver and the front passenger. Other features include ABS, Rolls-Royce Assist, and a specifically designed roll-over protection system that deploys from behind the rear head restraints. Also, the convertible comes with a heat detection system that detects both human and animal heat signatures, and issues an audible warning to the driver of possible danger.